You can’t ban one without banning the other, this Tobacco Free Smoke Free Environment Sign would seem to say. Both have health impacts, and to tobacco and smoke free customers are an intrusion. I find smokers very polite in agreeing not to imbibe while among the rest of us. I wonder were we to relent and permit smoking, what the result would be? I rarely encounter smokers in this day and age. Maybe they could be seen as less of pariahs if encountered only in moderation? 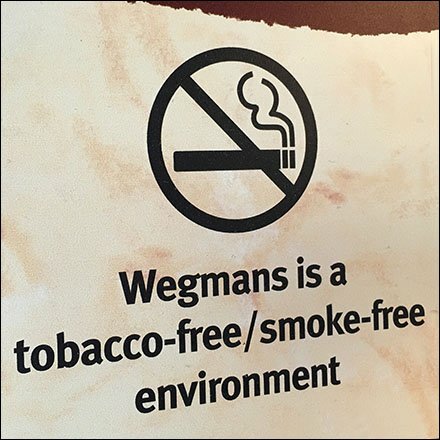 This Tobacco Free Smoke Free Environment Sign seen at Wegmans and part of an onsite series with similar look and branding.